Today at the annual PHE conference we announced new data showing that cancers in England are being diagnosed earlier. The proportion of people with cancer diagnosed as an emergency has fallen, despite a rise in the overall numbers of cases. The new information shows emergency diagnosis numbers had fallen to 1 in 5 in 2013, compared to 1 in 4 in 2006. This data is taken from the National Cancer Intelligence Network (NCIN) Routes to Diagnosis Project, which has been updated to include 2011-2013 figures for the first time. 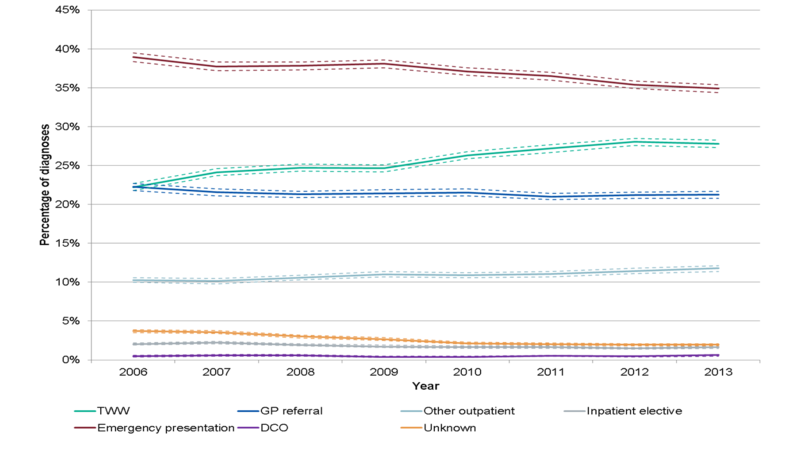 It shows that numbers of cases diagnosed as an emergency after presentation at a hospital have declined, while proportion of cancers diagnosed through urgent GP referral with a suspicion of cancer (known as the two week wait) has increased. Compared to the European average, cancer survival in England is low. Studies have suggested this difference could be largely due to later diagnosis, by which time cancers are harder to treat and have progressed to a more advanced stage. Indeed, early diagnosis formed a key part of the recommendations in the recently released cancer taskforce strategy. The importance of this led to the development of the National Awareness and Early Diagnosis Initiative (NAEDI). A key tranche of this work is the Routes to Diagnosis data, the preliminary results of which are launched today. 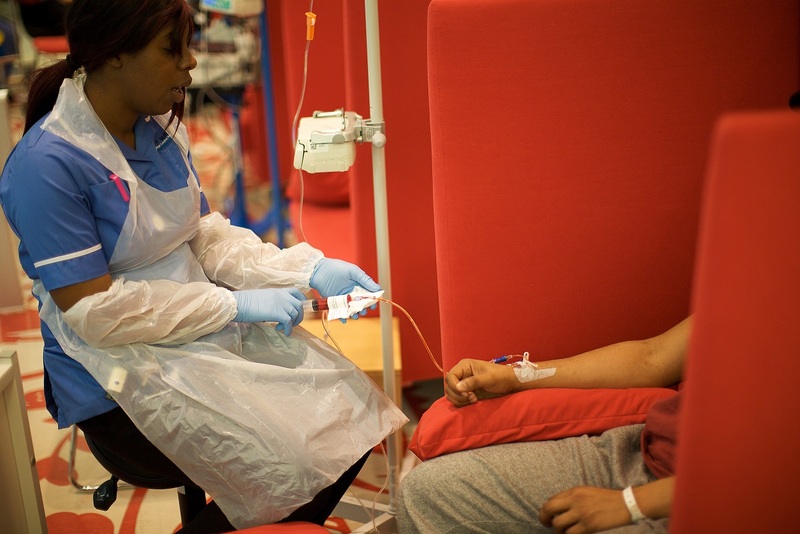 NCIN has worked with partners like Cancer Research UK on the Routes to Diagnosis project since 2007 and it has greatly improved the understanding of where delays arise. NCIN both defined a methodology to determine the route a patient took through the healthcare system before receiving a cancer diagnosis and collects and analyses the data on it. A Route to Diagnosis describes the end point of the pathway a patient follows to a diagnosis of cancer. There are eight aggregated Routes derived from multiple linked data sets. These include Two Week Wait (urgent GP referral with a suspicion of cancer) and Emergency Presentation (an emergency Route via A&E, emergency GP referral, emergency transfer, emergency consultant outpatient referral or emergency admission or attendance). Below you can see how lung cancer illustrates trends seen for each route. The full selection of results, including breakdowns by cancer site, year, age, deprivation and ethnicity are available on the NCIN website. For a common cancer like lung, the proportion diagnosed through the GP two week wait referral route increased from 22% in 2006 to 28% in 2013, while the proportion diagnosed through emergency presentation fell each year, from 39% in 2006 down to 35% in 2013. These figures are encouraging and show the positive impact of several years of work across the sector to improve early diagnosis in England, not least the work to define and record how people are diagnosed, but also work like PHE’s Be Clear On Cancer campaigns, which help people to spot symptoms early, and screening programmes which also improve early diagnosis. The decline in emergency diagnosis is, and will continue to be vital if we are to catch up with comparable European countries. There is still a lot of work to be done to ensure these figures keep going in the right direction and give England the chance to stand up against other nations; while emergency presentation is declining it still remains high for cancers like liver and pancreas. As well as variation by cancer type and between hospitals, there are also significant differences in the treatment of our older patients, such as being much less likely to have surgery than younger ones. The new cancer strategy makes clear recommendations for how we can improve England’s cancer survival and patients’ experience. There should be no reason why we can’t be as good as the best in the world.